You may first leave from the ship by coach which takes you to Ho Chi Minh city. 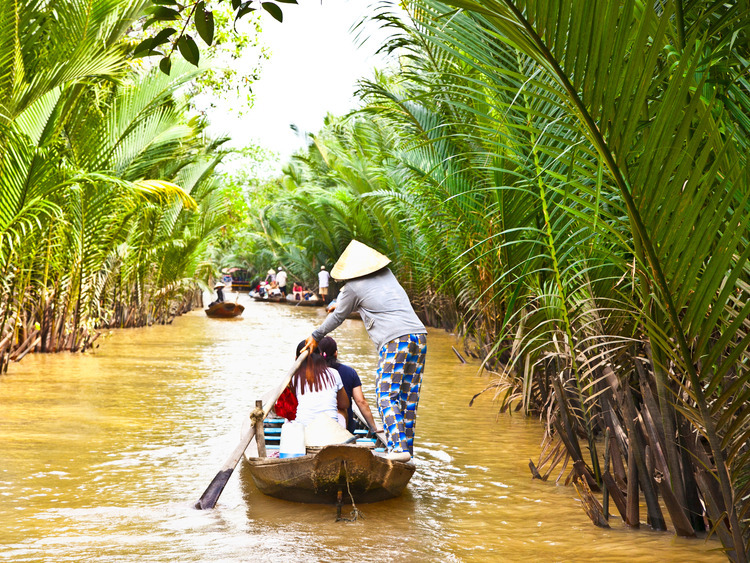 Your tour will begin by driving through the bustling streets of Ho Chi Minh City, thronged with people and vehicles of all kinds, to the Mekong Delta. You will drive along the national highway before arriving at My Tho City, where you will board a local boat and take a 30-minute cruise along the Mekong River to Tan Thach Commune. Here you will leave the boat and walk around, visiting a coconut candy workshop, where you will see how this local speciality is made. Your exploration will continue with a cruise aboard a motor sampan along the Tan Thach Canal to one of the well-known bee farms of the area, where you will have the opportunity to taste fresh honey tea and local tropical fruits, before going to have lunch at a local restaurant. After lunch, you will return to the coach to travel back to the ship. We will depart by coach along the national motorway to My Tho, where our boat awaits to cross the Mekong river delta, in the direction of the region of Tan Thach. Once we leave the boat, we will have the opportunity to visit a coconut sweet factory, which produces typical sweets of the area. We will set off on-board a motorised sampan along *_the canals of Tan Tach_until we get to one of the most famous bee breeding farms in the area, where we can taste the fragrant honey tea and local tropical fruit. Once we leave the bee breeding farm, we will return to terra firma for lunch, after which, by coach, we will return to Ho Chi Minh to board our ship. The coach transfer from Ho Chi Minh to the River delta takes approximately 3 hours. We recommend that you wear a sun hat.